This spacious and cozy farmhouse originally dated from 1910 is a wonderful place to spend a peaceful vacation in Fredericksburg, Texas! Situated on 6+ acres and surrounded by another 60 acres of pecan and peach orchards, it is a true 'country' retreat that is conveniently located just one mile from the Main Street shopping area. 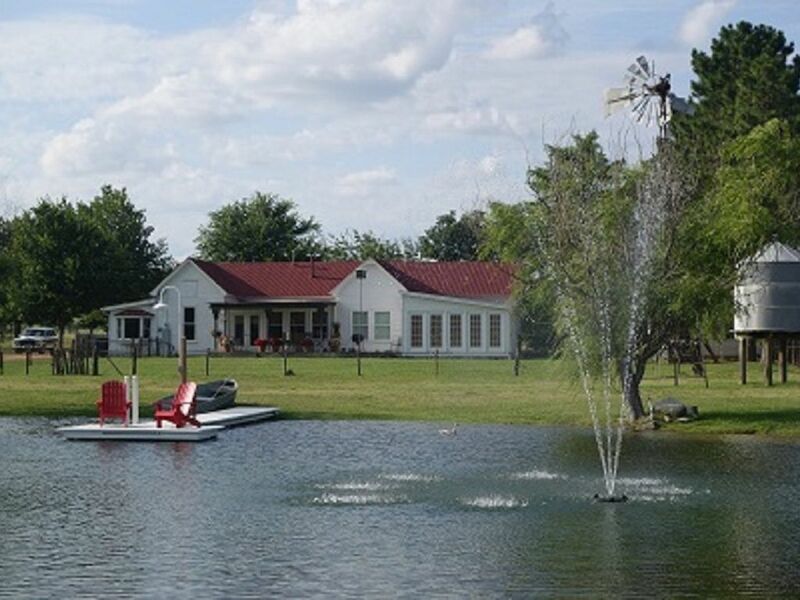 The property has a total of 5 bedrooms and 4 baths for you and your guests to enjoy along with a great outdoor area including your private pond fully stocked with fish and ready for fishing (bring your poles)! Your kids will love the outdoor play set as well! Sleeps 12 with party's over 10 an additional $25.00 per night per person. This house is perfect for a girl's weekend of shopping and fun, or a family retreat. Up to 10 people will be very comfortable and for an extra charge an additional two can use a pull out couch, just let us know. You will not want to leave after relaxing here with and enjoying the wonderful things that Fredericksburg has to offer! The property is gated and secure and has lots of space for walking, reading and just hanging out. A short walk on the other side of the adjacent property is a store and cooking school so check it out! This is on the property of Fischer & Wieser's farm. This farmhouse has its own corner of the property - and has pecan and peach orchards surrounding it. You might see Fischer or Wieser working in orchard or around property sometime during your stay. This property is very close to town but secluded like you are in the country. You have 6 acres to yourself along with another surrounding 60 ares to roam! This property is great for a family or bridal party. this is a hill country gem very close to town. NEW!!! Fischer & Wieser Culinary Adventure Cooking School Private or regularly scheduled classes available! Visit www.jelly.com to check it out or call (866) 997-8969 for more details! Come and cook with us! 6+ acres private acres (surrounded by 60 additional acres) , pond, peach and pecan orchards, very close to town yet secluded and safe (gated entrance).